High blood sugar levels damage the human body and can lead to several different health problems associated with diabetes mellitus. The diagnosis of diabetes or the condition known as pre-diabetes is based on a “normal” blood sugar level. The current standard is a condition of less than 100 mg/dL when fasting and less than 140 mg/dL when the count is taken two hours after consumption of food. Most healthy individuals have blood sugar levels which are considerably lower than these numbers. Blood glucose levels tend to be lowest just before meals. A typical blood sugar level for a healthy person who does not have diabetes (when taken before a meal) is 70-80 mg/dL. This number can range as low as 60 and be normal or go as high as 90. When fasting or dieting, the liver maintains sugar levels at a normal standard by turning muscle and fat into sugar. If blood sugar levels are allowed to drop to levels which are too low, hypoglycemia, a potentially fatal condition, may develop. Symptoms of this condition can include lethargy and impaired mental capacity, irritability, weakness in arm and leg muscles, twitching, shaking, a pale complexion, sweating, paranoia and ultimately loss of consciousness. At this point a possible side effect is brain damage. When blood sugar levels remain too high, an individual’s appetite is often suppressed for a short period of time. 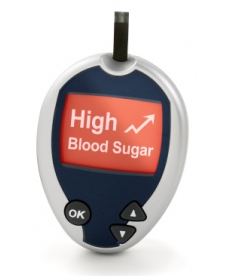 Long-term hyperglycemia and diabetes can result in heart disease or damage to the kidneys, nerves and eyes. Cordyceps sinensis has been found to help control blood sugar levels, which leads to an obvious improvement for individuals suffering from diabetes or pre-diabetes. A series of clinical tests have been conducted to measure the potential for treating such patients with Cordyceps. One trial compared the use of 3g of Cordyceps sinensis in one group while another group of diabetes patients were treated with the use of more conventional medications. The group receiving Cordyceps sinensis showed a 95% improvement in their blood sugar levels while the group receiving traditional medical treatment saw only 54% improvement in their blood sugar levels. Generally speaking, Cordyceps sinensis improves blood sugar metabolism and increases an individual’s insulin sensitivity. Cordyceps also has antioxidant properties which have a positive impact on fats within the bloodstream, such as cholesterol. Aside from lowering the blood sugar levels of diabetes patients, Cordyceps therefore provides additional health benefits. Because Cordyceps sinensis is a natural product, most patients exhibit absolutely no side effects from its use. Traditional Chinese Medicine (TCM) has long featured the use of Cordyceps as a natural cure and today’s alternative health practitioners are finding the same holds true with the illnesses most common in our current world.